A convicted burglar who is currently on parole for theft is charged with breaking into a Lincoln Park store early Monday and running off with its cash register. Police say they saw Kenneth King sprinting down a side street with a cash register on his shoulder around 12:30AM as they responded to a burglar alarm at Lush Cosmetics, 859 W. Armitage. 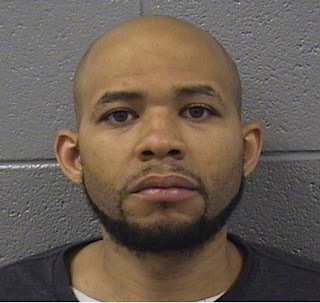 King, 36, is a Black P-Stone gang member who was given three concurrent 2-year sentences for Lincoln Park and Lakeview theft cases in in 2014. He was released after serving only six months in prison, according to state records. Overnight burglaries of businesses on the North Side have continued since King’s arrest. Just four hours after King was taken into custody, front doors were smashed in at two businesses in Wrigleyville and Boystown. The cash box was taken from Clark Street Sports, 3465 N. Clark, around 4:40AM. Moments later, a cash register was stolen from Salad House, 3176 N. Broadway. Yesterday morning, an employee reporting for work at Tolotzin Mexican Cuisine, 4431 N. Broadway, found a front window broken out and the restaurant’s cash register lying in an alley. Most recently, Gramaphone Records, 2843 N. Clark, was burglarized around 2:45AM today.